I will try to make at least a few more of these nice blocks! Real easy for me as I have a 9.5 inch square ruler – and I found a piece of cardboard to make the templates with! Thanks to Sophie for finding the block, and to Kristin for helping with making the templates easy to print! 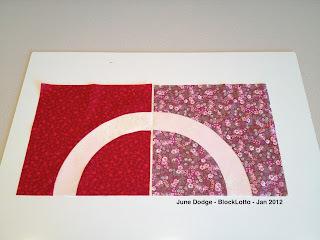 I had posted the first completed block last night, but since there were no comments I am changing the photo and time stamp of the entry to show the two blocks completed.